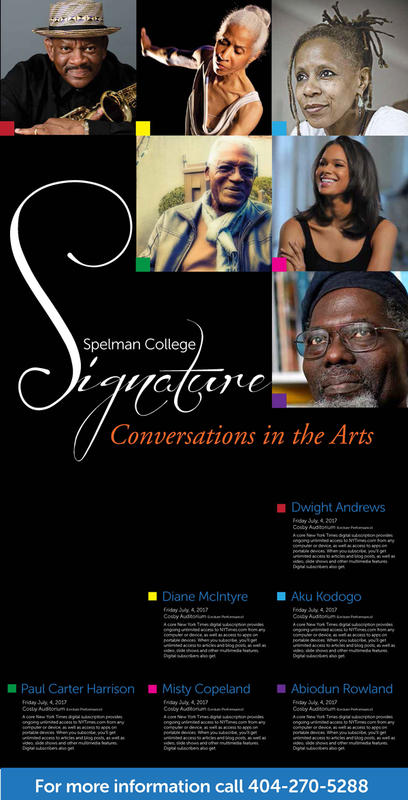 Challenge: Spelman College needed a poster to promote their new signature lecture series for the 2015 academic school year. The look needed to feature images that would be duplicated for individual fliers to promote the event dates. The look they wanted is elegant to reflect the President’s office commitment to the arts. Solution: The images for this project needed to be modular to establish the identities of everyone featured in the series. To achieve this I decided to focus on the “S” and build the poster elements around it and allow the eye to follow the natural curve the shape establishes. To tie the images to the copy, I decided to pull the color palette from previous Spelman Drama and Dance department projects to establish a color index for each of the artist.